Red Sox pitcher Steven Wright, charged with domestic assault, has been suspended for 15 games. 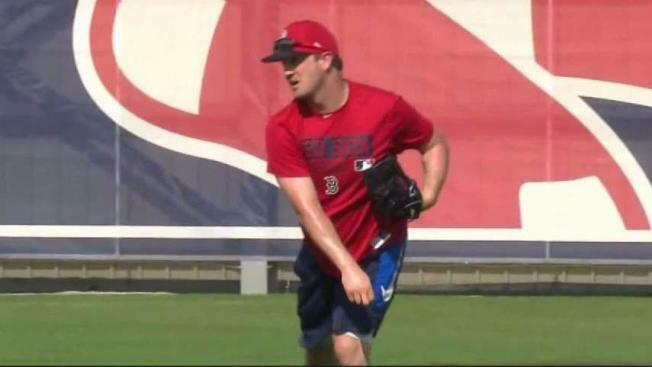 Knuckleballer Steven Wright returned to the Boston Red Sox after serving a 15-game suspension under Major League Baseball's domestic violence policy. The 33-year-old right-hander accepted the penalty in March without an appeal. He started the season on the disabled list while recovering from knee surgery, then served the discipline. Wright was arrested on Dec. 8 at his home outside of Nashville, Tennessee, and charged with domestic related assault and prevention of a 911 call, the Boston Globe reported. Both charges were misdemeanors. Prosecutors in Franklin, Tennessee, retired Wright's case on Dec. 21, contingent on him completing an anger management course, refraining from violent contact with his wife, and incurring no new criminal charges for a year, the Globe said. "I messed it up. It was my wrongdoing," he said Monday, standing at his locker in Fenway Park before the Boston's series opener against Oakland. "It was nothing that anyone else did. I did it to myself. Other than that, I'm just happy to have it behind me and move forward." Wright lost $94,624, which comes to 16 days of pay, during the suspension. He allowed seven earned runs in four outings for Triple-A Pawtucket from April 20 through Friday. To clear a roster spot, Boston placed right-hander Hector Velazquez on the 10-day disabled list with a strained back. An All-Star in 2016, Wright injured his right shoulder diving back to second base as a pinch runner in a game at Dodger Stadium that August. He finished the season 13-6 with a 3.33 ERA and made only five starts last year. He was 1-3 with an 8.25 ERA and left knee surgery on May 8. "It's been a long journey — something you never think of when you're having the year that I had in `16 and all of a sudden it just changes in one play," he said. "Almost, over two years — ever since I dove into that bag. It's nice to get back out there." Manager Alex Cora said Wright will pitch out of the bullpen. "Talking to the catchers, they're comfortable with him coming in, in the middle of the game," Cora said. "For me, obviously, every new situation is a new one. Having a knuckleballer come in, in the middle of the game, is not something everybody has."